Hello people of internet land and how are you on this fine day? Yesterday when the sun came out after raining for most of the day (it is England though so what did I expect), I realised that I had left my sunglasses at home. As I am currently at university this posed a problem, do I buy a new pair or just wait until I go home? Obviously any I don’t generally need an opportunity to buy something new, therefore I went on the hunt for new sunglasses. From my search I found a couple of favourites that I want to share with you. 1. This pair is inspired by the 60’s and 70’s. I just love the daisies printed on the frames, now unfortunately this kind of shaped lenses do not suit the shape of my face L but they are a favourite of mine and you can buy them from Asos for £12. 2. Now number two reminds me of something from Greece the Movie so I automatically love them and they have a great novelty factor. These are from Asos and are a little bit more expensive coming in at £20. 3. Don’t these sunglasses remind you of Ray ban Wayfarers’? Well they do me, but with awesome flowers on them. They are also much more beneficial for your purse, at the price of £7.99 from New Look. 4. On these sunglasses I love the purple frame with the pearled effect. They also appear to have darker lenses than the rest which is great for bright sunlight especially for light eyed people, as due to the light colour they are more sensitive to bright lights. These can be found at Topshop for £16. 5. I love the bright vibrant red colour of these River Island sunglasses, Don’t you think that they are perfect for summer? And they would go with any summer outfit. You can buy them for £13 at River Island. 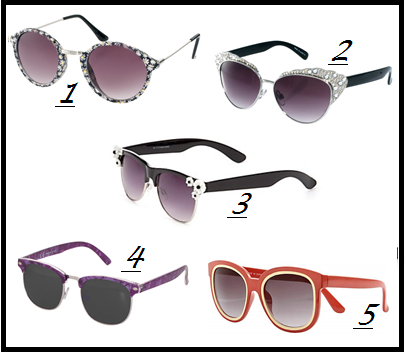 Well these are my summer sunglasses favourites what do you think of them? Do you buy a new pair of sunglasses each year, or have one pair that has lasted you for years?